Having attended my first Bridges in 2004 in San Francisco and seeing it again ten years later, it is impressive to see the growth. Ten years -- ten times the growth. Today’s GT Nexus is much more than the ocean freight solution of its early days. Fueled by globalization and businesses’ ever-growing need for visibility and analytics, GT Nexus continues their path of innovation. An amazing array of retailers, carriers, and manufacturers mingled, shared ideas, and presented their companies’ strategies and described how supply chain is front and center in their companies’ winning positions. 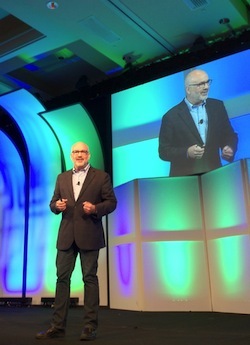 Day one kicked off with presentations by Kurt Cavano, left, one of the founders and current Vice Chairman and Chief Strategy Officer of GT Nexus;1 Sean Feeney, CEO, right; as well as some of their leading customers. Sean talked about the merger of TradeCard and GT Nexus and their endeavors to blend the people and the systems into a holistic company. GT Nexus employees are very passionate about this unification, which is important for GT Nexus with their “one” network strategy for serving their customers—their multi-tenant single database. Everything users do from messaging, forms and document management to transactions all ties back to the single database, reducing information cycle time and errors, and increasing supply chain collaboration. This is not just a “wrapper” around lots of different modules. (More on GT Nexus technology in the next section). Throughout the conference we were treated to presentations by companies large and small such as Wolverine, Guess, TOMS, Crocs, Canon, Molex, Restoration Hardware, Gap, Charles Komar & Sons, Ci Jeans, Patagonia, Lenovo, HP, and Caterpillar, to name a few, as well as major global carriers and freight forwarders. The partnership front for GT Nexus has a relevant set of partnerships with very important players to support the issues of today’s complex chains. (More on partnerships below). Partnerships also extend across the customer base where customers share development ideas and work on improvements for the overall industry. And that extends to taking care of the world and planet. 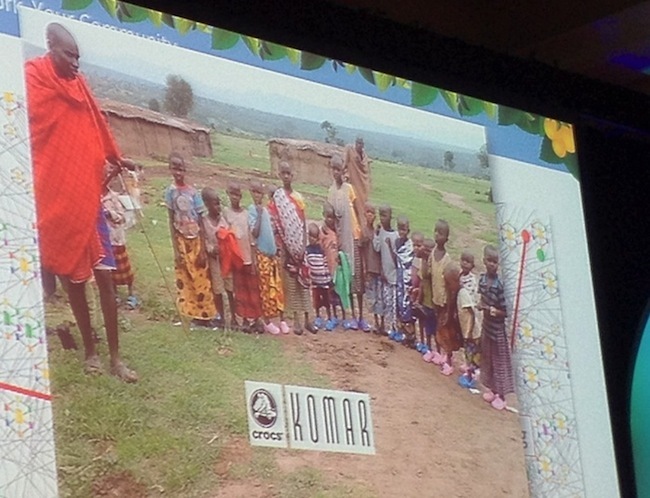 For example, Crocs and Komar, who met at Bridges last year, decided to partner to provide shoes to villagers in Africa. GT Nexus is a long-term cloud provider—one of the first—who launched their multi-tenant architecture in the early web era. They have remained true to this approach, so their ability to scale and support millions of transactions per year is core strength. Having said that, they take nothing for granted and have dedicated many resources for quality assurance. From the supplier side, we heard from the Brazilian manufacturer, Ci Jean, who, working with Charles Komar and Sons, was able to reduce the cost of cash by 2/3—from 8% down to 3%. That is a savings they can add to their margin as well as pass to their customers. Or Crocs, who reduced the administration of payment and audit work from 26 to .5 days, a significant productivity improvement, which also helps manage cash flows and provides better data through the chain so suppliers can provide accurate and on time shipments. These are only a few such examples that were discussed at the conference (and only a few of the many GT Nexus customers who use these capabilities). AppXpress: Today, GT Nexus is the largest multi-tenant cloud player in supply chain with a huge network of trading partners. Of course, no one software company can develop all the functions required by their customers. Customers always want more. They may need unique software to express their differentiation. As well, there are many ideas or apps (and associated development costs) that network members may want to share. Ocean Visibility: Early on, ocean visibility was GT Nexus’s differentiator in the market. Though other transportation software companies now include ocean, GT Nexus is still the leader here. Not sitting on their advantage, they have been tackling many of the challenges, such as data quality, inherent in this type of shipping. Though that might sound a bit mundane, those who do the day-to-day management know that trying to plan a supply chain with 60% accurate data is almost no management at all. GT Nexus, besides continuing to provide new innovative technology, provides end-to-end visibility from factory to store. Many companies with multiple legacy systems use the GT Nexus platform to not only integrate carriers to their company, but integrate across their own internal operations. 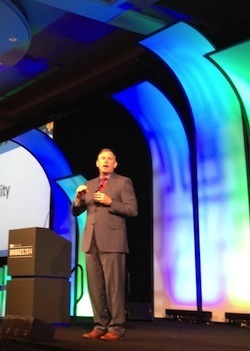 Caterpillar spoke at Bridges about the GT Nexus platform sitting on top of their 23 ERP systems. Restoration Hardware talked about their journey to better management of their carriers’ performance, as well as improved handoffs between suppliers, carrier, and inbound through the analytics provided by GT Nexus. Shipper Council: Years ago, GT Nexus launched a collaborative effort, the Shipper Council, to have shippers work together and drive change in the transportation industry by working on such issues as better technology, improving data quality, and improving the knowledge and expertise of the profession. I was privileged to witness this genesis of the Shipper Council at a user conference way back when. Frankly, I am surprised they are still around, since so many of these good ideas lie dormant. Au contraire, the council has not only tackled many of the thorny issues in managing global ocean transport, but the membership has grown over the decade. Hats off to their hard work! The New UI: After decades of menu-driven spreadsheet-like screens, GT Nexus is also releasing an updated version of their UI to support today’s mobile and visual user. TransVoyant: Supply chain visibility means so much more today than just the business data.6 The context in which things are happening helps in understanding the impacts to the process and people—providing the “why and what.” Data streams feed complex analytics so users can respond to or even prevent negative events. And as more shippers want to do dynamic allocation of goods in motion, having more predictability of those events becomes an imperative. So GT Nexus and TransVoyant make a good 1-2 punch. GT Nexus has shipment data. TransVoyant has context. The Fennimore Group: Process and Data Management are front and center of managing any supply chain today. Transportation, in particular, has a huge data burden that must be overcome. Implementations fail or system investments never really achieve their value without addressing these issues. Thus, Fennimore becomes a valued partner in the quest for high-value/high-performance supply chain management. Precision Software: Managing multi-mode, from supplier to consumer, is high on the list of shippers’ requirements for their TMS today. Precision offers the GT Nexus community the parcel shipping component required for outbound small B2B or consumer shipments. SEKO: Here is a new age broker model. Moving beyond traditional brokerage service models, SEKO leverages the GT Nexus platform (as well as their own technology developments) to provide both service and technology solutions for their customers. This is a model we have seen evolving for 3rd parties as they embrace cloud technology through partnerships with major transportation software providers. GT Nexus has never been a boastful company, an unusual approach in the over-hyped software industry. Their customers’ testimonies at the conference7 did a great job of doing that for them. Yet they could boast of their many attributes that are unique and of high value in the supply chain market. If we see the supply chain as a process of information, goods, and cash flow, there is only one provider that I can think of that actually acknowledges this reality. Though no one is perfect, their multi-tenant database that reduces the info cycle time, and community developerswho allow them to accelerate the task of plugging any holes in the solution (a never-ending task for any software provider) keep users interested in their “next act,” the next release. Since we are all global—and getting more so—the transportation software/cloud market has a huge growth opportunity still ahead of it. As I internalize what I experienced at the conference, though, I hesitate to categorize GT Nexus as transportation. Global trade? 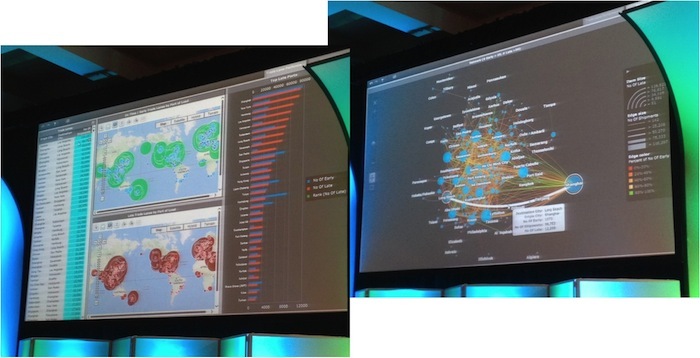 Global Execution Management? Defining new “spaces” is not my specialty, but with supply chain finance, procure-to-pay, B2B communications, as well as transportation, I would not want to pigeonhole them as a transportation solution. GT Nexus is strong in the EU and US. They do have an Asian presence serving financial needs for suppliers. As the Asian brand market of manufacturers and retailers grows, goes global, and acquires its own global suppliers (from North and South America, for example), we expect that GT Nexus’s ability to understand the financial and physical flows will enable impressive growth for GT Nexus in Asia, and in the world, in the years to come.